Thomas PRINCE Sr. (1618 – 1690) was Alex’s 10th Great Grandfather; one of 2,048 in this generation of the Miller line. 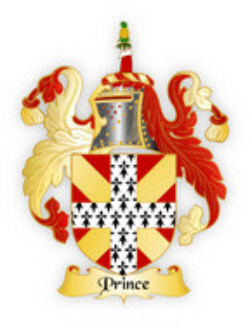 Thomas Prince Sr. was born about 1618 in South Pertherton, Somerset, England. His parents were Thomas PRINCE and Mary PATCH. He married Margaret SKILLINGS on 1649 in Gloucester, Essex, Massachusetts. Thomas died 17 Jan 1690 in Gloucester, Essex, Massachusetts. Margaret Skillings was born 1625 in England. Her parents were [__?__] SKILLINGS and Janet McILWRAITH. Thomas Prince is called brother-in-law of Thomas Skillings so Margaret may have emigrated with her brother Thomas Skilling. Margaret died 24 Feb 1706 in Gloucester, Essex, Massachusetts. 27 Sep 1676 in Gloucester, Mass 11 Jan 1705 Gloucester, Essex, Mass. 16 Sep 1674 Gloucester, Mass. Babson writes Thomas Prince was a brother-in law of Thomas Skillings. If this is true, then his wife Margaret would be named Skillings, and would have been a sister of Thomas Skilling. Thomas’ wife Deborah testified on behalf of Margaret Prince in an action against William Browne. Margaret and husband Thomas brought suit against William Browne in March 1657, alleging that he had made threatening statements against her, and as a result she lost her child. The testimony, scribed into the Quarterly Court Records, show a woman who had little relief from everyday life just because she was with child. Margaret’s brother Thomas Skillings was born in 1614 in Lavenham, Suffolk, England. He married Deborah [Prince?] 1642 in Gloucester, Essex, Mass. Thomas died 2 Oct 1667 in Falmouth, Cumberland, Maine on the shores of Back Cove, Portland, ME. Thomas was among the early settlers of Gloucester, Mass. His land was near the ancient burying ground. As early as 1651, he had moved to Falmouth (Portland), but had returned and was living in Gloucester in 1658, and that year came back to Falmouth and died there in 1667. In 1658, he purchased the farm at Back Cove from George Cleeves, which he occupied until his death and which was held in the family for many years. The farm adjoins the Deering farm in Westbrook and is about half a mile from Deering Bridge. 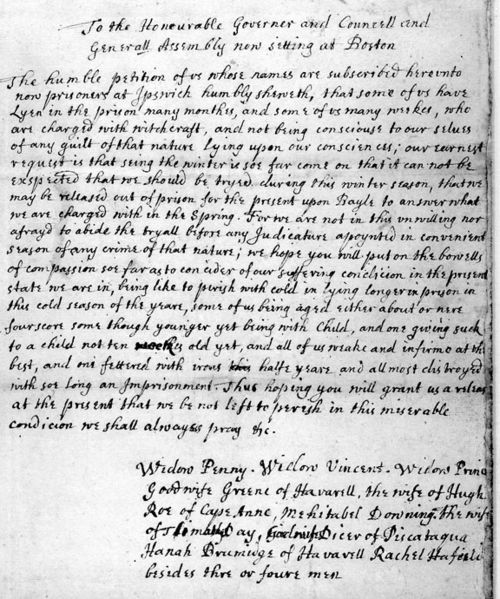 His will, dated 14 Nov 1666 and proved 2 Oct 1667, mentioned only two children – Thomas and John. He also had two daughters. His emigrant ancestor was in Salem prior to 1640 and doubtless wrote his name Skellen. The last Will & testament of Thomas Skelling, being very Weake In body, but in Prfect memory/ I giue to my sun Thomas one Cow, & a young steare & a Calfe / further I giue to my sun John one Cow / & I giue my Towles to bee deuided between them both / further it is my will to make my wife executrix to receiue & pay my debts, and all the goods yt I have to bee at her dispose dureing her Widdows estate, & if shee marry she shall haue but the thirds, & the rest to bee diuided aequally to all my children. Dated the 14th of Novembr 1666 / The Marke of THOMAS SKELLING. Thomas couldn’t write – he made his mark (:T:S). The inventory of the estate, taken by Phineas Ryder, George Ingersoll, and Nathaniel Willis, was: housing and land 80 pounds; marsh 10 pounds; 4 steers 22 pounds; 5 cows 20 pounds; 3 younger cattle 6 pounds; 2 calves 1 pound 10 shillings; 11 pigs 3 pounds 6 shillings; wheat and peas in the barn 3 pounds 8 shillings; 18 bushels wheat in the house 4 pounds 10 shillings; 6 bushels indian corn 1 pound 4 shillings; 60 lbs cotton wool 3 pounds; household furniture 32 pounds 16 shillings – total 186 pounds 14 shillings. Deborah [Prince?] was born 1622/23 in Lavenham, Suffolk, England based on her age when she married George Hadley. Thomas Prince is called brother-in-law of Thomas Skillings, so Deborah could be sister of Thomas Prince, though this is less likely than Margaret, wife of Thomas Prince was the sister of Thomas Skillings. After Thomas died, Deborah married George HADLEY 29 Jun 1668 Ipswich, Mass. George was our ancestor with his first wife Mary PROCTOR. In 1692 Deborah was a witness in support of her neighbor Elizabeth Howe accused in the Salem Witch trials. Elizabeth was found guilty and executed on July 19, 1692. Babson writes that Deborah had “suspicious carriages” with Thomas Patten, for which her husband was required to be bound for her good behavior at court in 1653. Thomas Prince came to Gloucester prior to 1650 and settled at the Harbour on what became Front Street. The Front Street Block is a historic block in the West End at 55-71 Main Street in Gloucester, Massachusetts. The block was built in 1831 and added to the National Register of Historic Places in 1974. Gloucester was founded at Cape Ann by an expedition called the “Dorchester Company” of men from Dorchester (in the county of Dorset, England) chartered by James I in 1623. This date allows Gloucester to boast the first settlement in what would become the Massachusetts Bay Colony, as this town’s first settlement predates both Salem, Massachusetts in 1626, and Boston in 1630. At his death, he left an estate of £153. Not all of the accused witches of the Salem Witch Trials actually lived in Salem. A number of the accused also came from nearby towns such as Salisbury, Ipswich, Andover, Topsfield and Gloucester. Andover and Gloucester had more accused witches than any other towns outside of Salem. A total of nine Gloucester women were accused of witchcraft during the hysteria of 1692: Esther Elwell, Margaret PRINCE, Elizabeth Dicer, Joan Penney, Phoebe Day, Mary Rowe (Margaret’s daughter), Rachel Vinson, Abigail Rowe (Margaret’s granddaughter) and Rebecca Dike. Not much is known about these cases since many of the records have been lost, but we do know three of the groups of Gloucester residents accused of witchcraft in 1692 were closely connected. Much like the accused of Salem, the accused women of Gloucester were also either prominent, wealthy citizens or trouble-makers or relatives of other accused witches. These accusations all involved people of high social and economic status. The Gloucester accusations involved no singling out of poor, marginal women. All of the recorded estates of these families were valued at more than two hundred pounds. They all had comparatively large holdings of land and held many town offices. The cases seem to have been based on fear and suspicion among the upper class against a backdrop of paranoia throughout the county. 2. Phoebe Day, Mary Rowe, and Rachel Vinson were accused sometime in the fall of 1692. There is no record of their accusation or examination extant, but their names were on a petition to the governor and council signed by a group of prisoners held at Ipswich jail. 4. A warrant for the arrest of another group of women, Esther Elwell, Abigail Rowe, and Rebecca Dike, was issued on November 3, 1692, for afflicting Mrs. Mary Fitch. In September of 1692, Gloucester resident Ebenezer Babson asked some of the afflicted Salem village girls to visit his mother, Eleanor, who was complaining of spectral visions of Indians and French soldiers. Upon visiting Eleanor, the girls accused Margaret Prince and Elizabeth Dicer of bewitching her. Margaret Prince was the grandmother of Abigail Rowe and mother of Mary Prince Rowe. She was known for being troublesome and having a sharp tongue. In the summer of 1692 Ebenezer Babson and his family reported that strange noises, as of persons running about his house, were heard almost every night. Babson, on returning at a late hour also saw two strange men come out of his house and disappear in his cornfield. He stated that he could hear them converse and that one said, “The man of the house is come now, else we might have taken the house.” The entire family, becoming alarmed, retired to the garrison to which place they were followed by two men. On another day Babson, who seems to have experienced a monopoly of these occurrences in the town, saw strangers who appeared like Frenchmen, and at another time the number was increased to six. A party went in pursuit. Babson overtook two and tried to fire at them but, strange to relate, his gun persistently missed fire. A short time afterwards he saw three men, one wearing a white waistcoat. This time his rifle proved trusty. All fell beneath his unerring aim but on his approaching the dead or wounded men arose and ran away, one discharging a gun as he went. At length one of these spectral marauders was surrounded so that escape was impossible. He was shot by Babson, but this time when Babson approached to take possession of the body it mysteriously disappeared. For quite a time afterwards a company, supposed to be French and Indians, prowled about the garrison and held loud conversations in a swamp near by. Babson, on his way to the harbor to carry the news, was fired upon. The people became greatly excited and appealed to the outside towns for help. Ipswich responded with 60 men to assist in putting these strange intruders to flight. The excitement soon abated, Babson seeming to be the only person to whom these extraordinary manifestations were revealed. Rachel Vinson was the widow of William Vinson who’s first wife had also been accused of witchcraft along with Ruth Dutch. Mary Prince Rowe was the mother of Abigail Rowe and daughter of Margaret Prince. She was held at a jail in Ipswich, along with Elizabeth Dicer and Joan Penney. Their names appear on an undated petition asking to be released on bail until their trial. Joan Penney, who was accused by Zebulon Hill, a former Gloucester resident who had recently moved to Salem town. Joan Penney had numerous squabbles with neighbors over land and had also been brought to court a number of times for such crimes as wearing a silk scarf and “breach of sabbath” after she carried bushels of corn on her way to church. 4. Rebecca Dike, Esther Elwell and Abigail Rowe. Shortly after, in October or November, James Stevens, a deacon of the local church and lieutenant in the militia, sent for the afflicted girls of Salem village to name the witch he believed was bewitching his sister Mary Fitch, wife of John Fitch. The girls named Rebecca Dike, Esther Elwell and Abigail Rowe. After Fitch died, Stevens filed a complaint with the magistrates. A warrant for the three was issued November 5. James Stevens, the complainant, was an important figure in town, a deacon of the church, and a lieutenant in the militia. He married Susannah Eveleth, daughter of Sylvester Eveleth, in 1656. Rebecca Dike: her maiden name was Dolliver and she married a man named Richard Dike who held a large amount of land in Gloucester. Rebecca was neighbors with the in-laws of the Stevens family, the Eveleths, and had many problems with them. Hugh Rowe and his older brother John received equal portions of their father John’s estate of £205 16s. 10d. Five years later, Hugh and John entered into an agreement witnessed by Robert Elwell, who owned land near theirs. In 1685, Hugh Rowe received three parcels of land from his “father-in-law” William Vinson, likely the father of his first wife, Rachel Langton. Hugh and Rachel Rowe’s daughters married sons of Anthony Day. Another of Anthony Day’s sons, Timothy, married Phoebe Wilds, one of the women mentioned in the Ipswich petition. Thus Hugh and Mary Rowe lived near Robert Elwell and had a close relationship to William Vinson and the Day family. Mary was also the daughter of Margaret Prince. All of the Gloucester women whose accusations are known only from the Ipswich petition were connected to the Rowe family. This provides clear evidence that there was a connection between their accusations and the accusation against Esther Elwell, Rebecca Dike, and Abigail Rowe. The likely cause of the accusations was animosity between different members of the town elite, which spiraled out of control in the context of the witchcraft panic and other tensions facing Massachusetts at the time. Fortunately for the accused, it appears that these cases never went to trial because the use of spectral evidence was banned in October of 1692, giving prosecutors little evidence to go on, and the special court set up to hear the Salem Witchcraft cases was disbanded. In November, public officials set up the Superior Court of Judicature to hear the remaining witchcraft cases but between January and May of 1693, most of the accused were released due to a lack of evidence or tried and found not guilty. 6 & 2. Thomas’ son Isaac received a soldier’s lot at Kettle Cove in 1679, instead of John. Mary’s first husband Hugh Rowe was born 1645 in Gloucester, Essex, Mass. His parents were John Rowe and Bridget Jeggles. He first married 10 Jun 1667 in Gloucester, Essex, Mass to Rachel Langton (b. 1650 in Ipswich, Essex, Mass. d. 7 Mar 1674 in Gloucester, Essex, Mass. )Hugh died 11 Dec 1696 in Gloucester, Essex, Mass. Mary’s second husband Isaac Elwell was born 27 Feb 1641/42 in Salem, Essex County Mass. His parents were Isaac Elwell and Joanne Dalliber. Isaac died 4 October 1715 in Gloucester, Essex County Mass. Mary was imprisoned with her daughter Abigail, accused of witchcraft in Gloucester. This entry was posted in 12th Generation, Immigrant - England, Line - Miller, Storied, Witch Trials and tagged Gloucester. Bookmark the permalink. 6 Responses to Thomas Prince Sr.